Picture Happiness on Earth is an international workshop project with several countries in Asia-Pacific region. The goal is for catalyzing people to consider happiness between person and Earth. This project is been expanded by "TSUNAGARI" project that is originated in Miraikan. 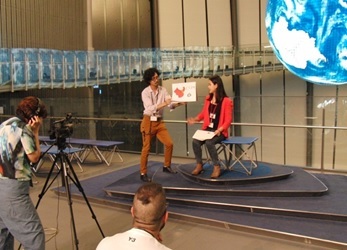 In this report, I would like to introduce about the concept of "TSUNAGARI" project, the outline of Picture Happiness on Earth and the engagement in China Science & Technology Museum, Beijing, China. When I saw Geo-Cosmos at the first time, I lost my word because of its beautiful and majestic figure. Geo-Cosmos is the symbol exhibit in Miraikan. It is a ground screen which has thirty tons, six meters diameter and over ten thousands of organic EL panels. It is the world's first "Globe-like display" using organic. 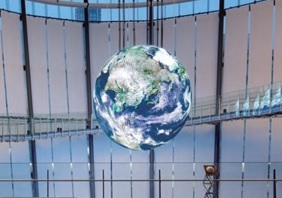 Actually, Geo-Cosmos is the symbol exhibit in Miraikan and the core of the project named "TSUNAGARI", means connection in Japanese. The "TSUNAGARI" Project was initiated by Miraikan in 2011, and with the three tool of Geo-Cosmos, Geo-Scope, and Geo-Palette. Through collaboration between researchers and artists within and outside Japan, this project involves collecting scientific information about the Earth, and presenting and communicating the information in a visual manner that appeals to the senses. The mission of this project is to deepen our knowledge about Earth and ourselves, consider what to do in order to relate today's Earth to future generations, and create a vision for the future, with people around the world. 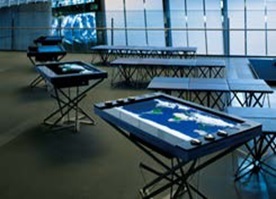 These three tools connect the exhibition system to the world, and create a new perspective of the Earth based on the concept of "TSUNAGARI" (links/relations/connections). We aspire to work other science museums and research institutes, and become a base for receiving and disseminating data to make Earth sustainable. Everyone can feel the Earth by viewing Geo-Cosmos. If you want to know deeper, Geo-Scope is a powerful tool for searching for the Earth. 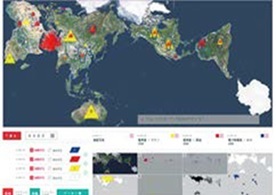 This interactive board allows you to access various Earth observation data collected from domestic and international scientists and research institutes. Thirteen boards in different sizes will be aligned on the exhibition floor. After viewing and searching the Earth, you maybe want to create a unique Earth by your hand. In fact, a different tool would be helpful. It is called that Geo-Palette. Miraikan is engaging variety activities for expanding the concept of "TSUNAGARI". 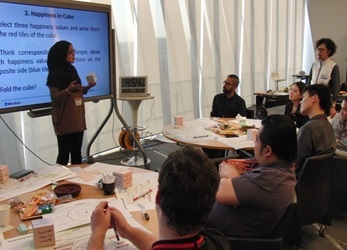 Thanks for sponsoring from Bloomberg L. P, which is a financial software, data, and media company in the U.S, Miraikan launched an international workshop activity. Its name is Picture Happiness on Earth collaborated with several science museums and science centers who are from the Pacific rim countries. For engagement the project, it is necessary to support students from educators. 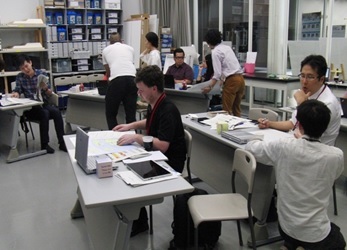 Educators, who are from Australia, Philippine, Malaysia, Singapore, China and Shizuoka, Japan, attended a training program in three days in Miraikan. 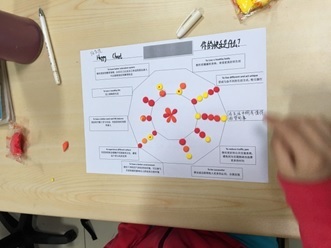 During the training, they learned about the concept, tool and contents of TSUNAGARI. 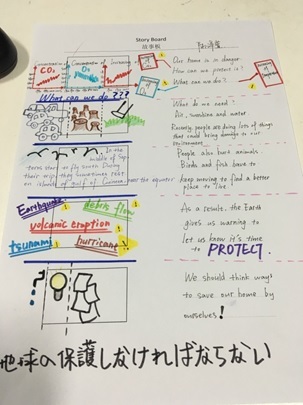 In addition, they joined Miraikan's workshop and created their stories that combined by variety data from Geo tools and their original messages. 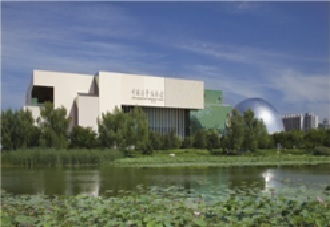 Educators publishing their stories in front of the "Geo-Cosmos"
China Science and Technology Museum established in 1958 in Beijing, China. After several times of reformation and movement, the newest building was completed in Beijing Olympic Park in 2009. The famous Nest stadium is nearby it. By the way, my hometown is Beijing so that I am quite familiar with this museum. 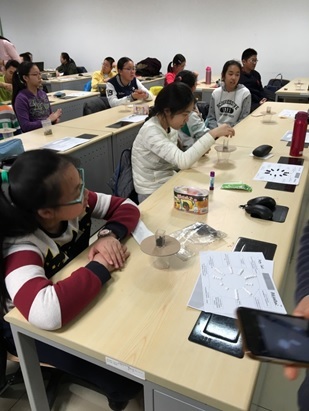 In China, there were nighty-nigh teenager students who attended four times of the workshop. First, students filled out a weight chart for considering happiness about person and the earth. The chart, named 「Happiness Chart」, was developed by Miraikan's science communicators. Happiness Chart is for estimating personal happiness. There are ten factors, such as to be healthy, to live a wealthy life and so on. Students used small clay pieces to show the weight for every factor in themselves. 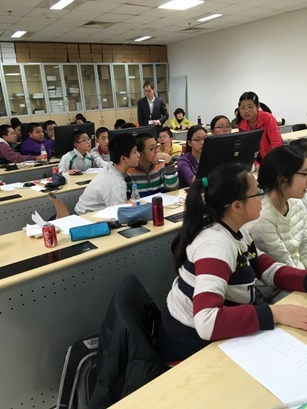 Since the air pollution is extremely serious in China, the topic of the workshop is environmental issue. 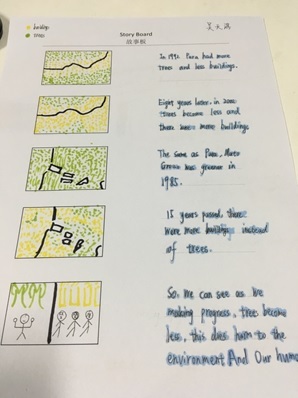 After doing a simple experiment to observe filtering dirty air, students created their stories. They used Geo-Scope devices which were loaned from Miraikan by free. 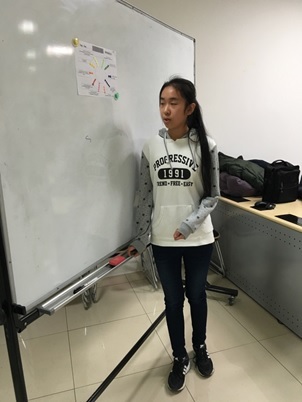 For sharing with different countries' student, they wrote their stories by English. Twenty two students would like to take videos. Now, museum staff are helping them to take videos. The online voting website will be launched. Any people are able to vote their favor short movies in the website. The No.1 movie is the one that received the most number of votes from general people and experts. 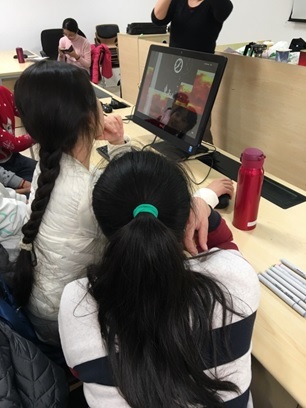 Then, Japanese students arrange stories to a new one and create a new content in Geo-Cosmos based on the new story. I would like to introduce the result of their voting. It is Miraikan's happiness for expanding TSUNAGARI around the world. There are several science communicators who are in charge of contacting with different countries. I am with China Science & Technology Museum. Another science communicator, named Furusawa Kiyoshi, is going to report engagement in Philippine in the later blog. My name is Chen Du. I encountered science communication when I participated in the Science Cafe held in the campus of the university. After that, I joined internship programs for science communication at scientific institutions, including the Science Museum in London. Through this experience, I found that I love to interact with people and that a job to talk about scinece would suit me more than studying science. That's why I joined Miraikan in the spring of 2014.